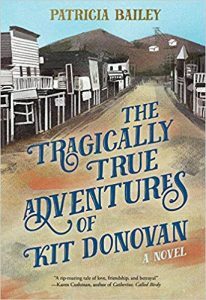 THE TRAGICALLY TRUE ADVENTURES OF KIT DONOVAN is out in paperback!! And it has a bright and shiny new cover. And it has a blurb from the legendary historical fiction writer Karen Cushman right there on the cover! Isn’t it lovely? It totally reminds me of covers of books I read and loved when I was a kid. Plus, there’s just something so accessible about a paperback book. Confession: When I opened the box of hard cover books Albert Whitman & Company sent me last year, I couldn’t touch them. Seriously. I could barely look at them. They just seemed so real and so scary and so serious I couldn’t quite believe they were mine. But when I got my box of paperbacks last month, I reached right in and pulled one out. I even flipped through it. I wasn’t afraid of breaking it, or making it dirty, or otherwise mishandling it. It felt familiar – in a way the hard cover never did for me. I hope that readers find the paperback as enticing and as comfortable as I do. 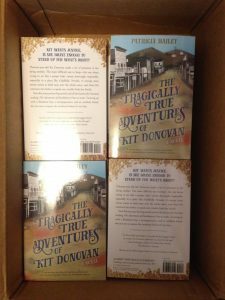 If you haven’t picked up a copy of THE TRAGICALLY TRUE ADVENTURES OF KIT DONOVAN, now you can for the paperback price. (How fun is that?). And if you have bought a hard cover, thank you! You still might want to take a look at the beautiful new paperback, though. It’s so pretty and such a good deal, it’s hard to resist. < Previous KIT’s Winning Awards! Wonderful! Does this mean I can write on the pages, and turn the edges, splay the spine, and make it mine? Yes!! Splay away 🙂 I’m excited because it may mean that I will actually be able to read it finally.